23 Foreclosed, lots, Save 65%, 2-Blocks to beach) click here | Our NEW Blog Site *Back To Main Page* | Search MLS Featured Properties | Search By Complex | Commercial For Sale | Links | Vacation Rentals | What's Your Property Worth? 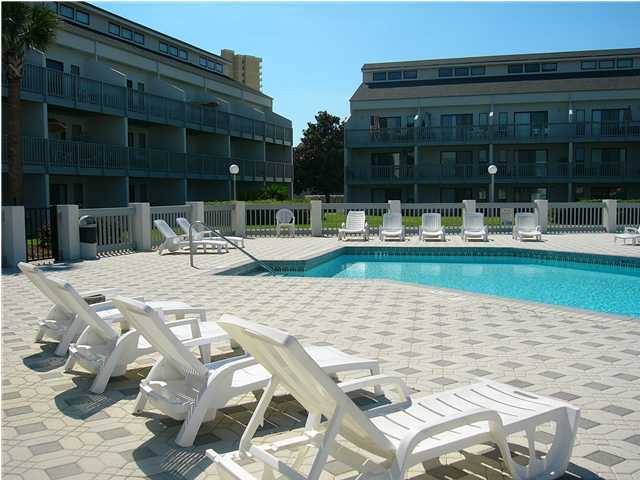 Endless Summer is a very nice family oriented complex located on the quieter west end of Panama City Beach. It is across the street from the beach with easy access to the beach. Their B, C, D, E, and F buildings surround a beautifully landscaped courtyard where there are 2 pools, shuffleboard courts, and a club house. The 1st and 2nd floor courtyard/poolside units are 1 bedroom, 1 bath, and sleeps 4. The 3rd. floor units are 1 bedroom with a loft and sleeps 6, (no elevators). When booking a unit. Please note: number of occupancy. All units have fully equipped kitchens. Some 1 bedrooms do not have a washer and dryer in the unit. They do have coin operated laundry on the premises. 1 Br = 1 bedroom sleeps 4 in the courtyard/pool area. 1 Br loft = 1 bedroom sleeps 6 with a loft in the courtyard/pool area. Revised: November 13, 2010 . Click on any photo below to view their residential listings. Lic. in Ga. & FL. Lic. in Ga. & FL. Below is a list of communities and Our Web Site for each one. Search all available properties (updated daily). www.5BuckBackup.com Lowest priced online computer backup service available today. 9. www.CitiStarRentals.com Our 20% Vacation Rental Web Site. List your property or book a vacation! 10. www.CommercialLandPC.com See all commercial buildings and land listings. 18. www.EmeraldIslePC.com See available Emerald Isle Gulf Front Condo's here. 19. www.EmeraldPointePC.com See All Listings at Emerald Pointe Thomas Dr.
21. www.EnsoleilPC.COM See available En Soleil Resort Gulf Front Condo's here. 22. www.FinisterrePC.com See homes and lots for sale at Finisterre on Grand Lagoon. 23. www.FreeportTownHomes.com New Bank Owned Town Homes at below wholesale prices. 24. www.FrontBeachRd.com See commercial and single family listings on Front Beach Rd. 25. www.FrontBeachPC.com See commercial and single family listings on Front Beach Rd. 26. www.FrontBeachRoadPCB.com See commercial and single family listings on Front Beach Rd. 31. www.GrandviewPC.com See available Grandview Gulf Front Condo's Listings here. 33. www.GulfcrestPC.com See available Gulf Crest Gulf Front Condo's Listings here. 35. www.GulfHighlandsPC.com See available Gulf Highlands Beach Resort Listings here. 37. www.HibiscusPC.com See available Hibiscus By The Bay condo Listings here. 38. www.HibiscusPenthouse.com See the Best Priced Penthouse in Bay County. 40. www.HorizonSouthPC.com See available Horizon South condo Listings here. 42. www.HotPCBNews.com See the latest announcements and articles here. 59. www.MYSellPrice.com Get the sale price for your property here. 66. www.PalmCovePC.com See all homes for sale at Palm Cove on Middle Beach Rd. 67. www.PalmsOfFreeport.com New Bank Owned Town Homes at below wholesale prices. 71. www.PCBREO.com Bank owned properties web site for Banks and asset managers. 89. www.StealThisCondo.com redirected to HotBeachBuys.com best buys at the beach. 99. www.ThePalmsPC.com Search available listings at The Palms on Front Beach Rd. 114. www.CommercialLandPC.com See all commercial land and building listings in mls. 115. www.FrontBeachRd.com See commercial and single family listings on Front Beach Rd. www.IndoorDigitalBillboards.com Hottest new advertising medium available at the beach today. Like the big outdoor digital billboards but they indoors in high traffic area's around the beach. Only $50 a month to advertise. www.5BuckBackup.com Best online backup for your computer. Cheap! Unlimited Space! Less than $5 backs a month to protect your data. I highly recommend the 12 month plan with 1 month free.